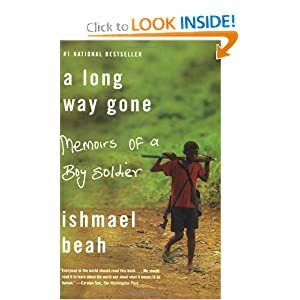 A Long Way Gone: Memoirs of a Boy Soldier by Ishmael Beah left such a robust impression on my mind. I couldn’t stop thinking about his life. I just can’t imagine being in his shoes. My heart cried out for boys like Ishmael. I wish I could help. All I can do is pray. When I saw movies like “Black Hawk Down”, I just couldn’t understand how little boys can kill. Now, I know that it’s the effect of drugs and grief. Also, I could have never imagined that such boys are educated enough to read Shakespeare. This book has literally removed my ignorance on this issue. I am proud of UNICEF. It was so nice to know that such organizations are making such a big difference in the world. I wish I can help somehow in the near future in my own way.